Combined Motor Holdings (CMH) has been listed on the JSE since 1987. During the past 20 years the company has grown its earnings per share by a stunning 1728%, or 15.6% per annum. Furthermore, it has grown its dividends per share by 2871%, or 18.5% per annum during the same time period. Yet, despite this excellent track record, the company still flies under the radar of most investors - it trades at a lowly P/E of 9.3x and juicy dividend yield of 5.9%. In a sense it is unsurprising that investors take one look at the industry it operates in (motor retail) and decide the stock is a no-go. SA vehicle sales have gone nowhere during the past five years as consumer spending and economic growth have faltered. This begs an interesting question: How has CMH managed to keep growing its earnings at a rate of 15% per year, whilst operating in a virtually no-growth environment? An unrelenting focus on cost control and cash flow: which has helped CMH to remain profitable in a shrinking market. Share buybacks: CMH has bought back 23 million shares, or roughly a quarter of the total shares in issue during the past 20 years. We are very pleased to see a firm buy back its shares when they are trading well below fair value, so at times, McIntosh’s move is an excellent use of capital. Diversification across several business lines: namely New Vehicles, Used Vehicles, Parts and Car Hire. As mentioned above, it’s easy to think that the fortunes of CMH is directly tied to new vehicle sales. However, only 20% to 25% of its total revenue is derived from the new vehicle market. This diversification means that the decline in new vehicle sales is countered by growth from other segments of the business, namely used vehicle sales, car hire (CMH owns First Car Rental), parts and services, and financial services. First Car Rental is the jewel among the business units, having enjoyed 20%+ annual growth since 2008. It recently contributed 24% to CMH’s operating profit. 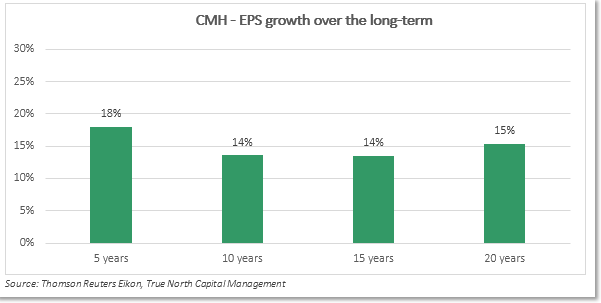 After fighting strong headwinds during the past five years, CMH should ultimately benefit from the tailwind of higher economic growth over the next three years. Local industrial shares already reflect these improved economic prospects, with a company such as Imperial Holdings already trading at a P/E of 15. CMH trades at 9.3, which is still slightly below its 10-year average P/E of 10.5. The illiquid share price shouldn’t be a problem for retail investors, but the downside to the CMH investment case is that, at 71, McIntosh is nearing the end of his career. While a succession plan should be in place, it will take time to see if the new CEO possesses the same brilliant business skills. CMH is set to release their latest financial results on the 17th of April - and we will be eager to see if there is any indication of imminent leadership changes. PS: McIntosh is a good 16-years younger than one Warren E. Buffet.